“Within the first 5 years, 50% of businesses fail. What can you do to reduce Risks to significantly increase your odds? Read on !!! 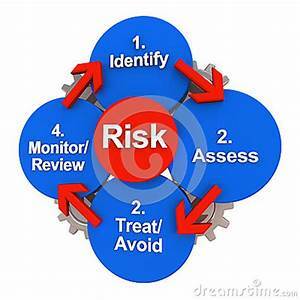 Risk Topics: ID, Consequences, Impact, Treatment, Monitor. Day Job, Home-Work, Free Help, Competitors, Pricing, Small, Negotiate, Liability, Passion. If you start a new venture without first thinking about and limiting Risks, you can put your finances — and worse yet — your relationships in jeopardy. What starts as a way to build your dream – by following your passion – can turn into a nightmare, if you don’t limit your Risks. Discover, recognize and assess the Riskss that might affect your business or its outcomes. Once the Risks are identified, Entrepreneurs need to determine the likelihood and consequence of each Risk. Businesses need to develop an understanding of the nature of the Risks and its potential to affect Goals. Entrepreneurs then need to “prioritize” the Risks according to its potential impact. This should be determined by combining the possibility of likelihood and the consequence or effect it will have on the business. A decision then needs to be made about whether the Risks are acceptable (meaning the business doesn’t view the Risks to be high impact or detrimental to business), or whether it is serious enough to warrant Treatment (see next paragraph). Avoidance– eliminate the Risks or withdraw from the Risks. Reduction – optimize and mitigate the two types of Risks – high & low. High Risk: critical situations that have a “high” impact (ie, on Product delivery). Reducing: having an Inventory Low Risk: inconveniences that cause minor delays. Reduce: work-a-rounds, etc. Sharing –the Risk by Out-Sourcing – part or all of the Risks to a third party (ie, marketing, manufacturing, fulfillment, etc). Retention – accept the Risks and plan accordingly. For Example, the company should be able to afford to keep the Risks on board as there are enough Risks control measures in place to manage it. #5. Monitor & periodically Review . . .
B. more Specific ways to “reduce” Risk. #1. Keep your Day Job – as long as you can. It’s important to have that steady and predictable income during the day to support you and your family (if you have one) while you follow your passion in the other hours. #2 Do your Home Work . . ..
so you know what you’re getting into. The more you know, the better able you are to reduce the Riskss – by not making naïve mistakes. Find out what your Target Market is like. Share your idea with your Network, Friends & Family – so they can give you feedback. #3. Get all the Free Help you can. Find out-sources (ie, Consultants), willing to invest their time for a piece of the venture’s future income instead of upfront cash. Most people are looking for an opportunity to get ahead without Risksing too much. If someone can invest a little of their time with the hopes of making a huge return, they may jump at the chance. #4. What’s your Risks from Competitors. What is the number and “clout” of your competitors. Having none is a Red flag (may mean no market), but having more than a couple of large ones may mean this is a crowded space. Even in an open space, you need Intellectual property, like Patents, to keep potential competitors from taking advantage of you. #5. Never “under-price” your Product. Some Founders have a tendency to price their products or services low during the beginning days of their businesses. The idea is that low prices will set them apart in their market. However, as operating costs increase, so will the need to increase prices. When this happens, your loyal customers may be offended, feeling that price increases are unfair. The wiser route would be to come up with a more effective way to differentiate your solutions from your competitors’. That way, you’re able to justify your increasing prices. It’s impossible to make a profit if your solutions are priced too low. To avoid these financial Risks, do some extensive Market Research. Then, price your solutions near or just above the market average. You look better to the public – lowering, rather than raising – your prices. #6. Take lots of Small Risks. In the Investing World, everyone talks about Risks Tolerance – the measure that determines how psychologically comfortable you are with the possibility of losing $$$. This is good to know, but more critical is knowing your Risks Capacity – How much $$$ can you afford to lose without it ruining your life? Start small & slowly. Immediately committing thousands of dollars to an idea is too big of a Risks. Start by put a little and getting a little back. Next time, you can put a little more out there and hopefully get a little more back. Keep increasing – as you feel the confidence. #7. Negotiate “fiercely” to get what you need. If you are producing a product or providing a service that could lead you to get sued, you must protect yourself against lawsuits by incorporating. See what’s best for your situation. [Probably a C-Corp] Also have the proper Liability insurance. Don’t Risks Fnancial Disaster by not shielding your Personal assets from your Business assets. #9. Will your Passion carry you thru? Can you take the Risks & have the passion to persist thru tuff times & bounce back from failures? Do you have strong goals to enjoy the challenges & rewards of entrepreneurial success and that you really want to start a successful start-up. Comments: Do you know any other ways to reduce or eliminate Risks – when Starting a Business?